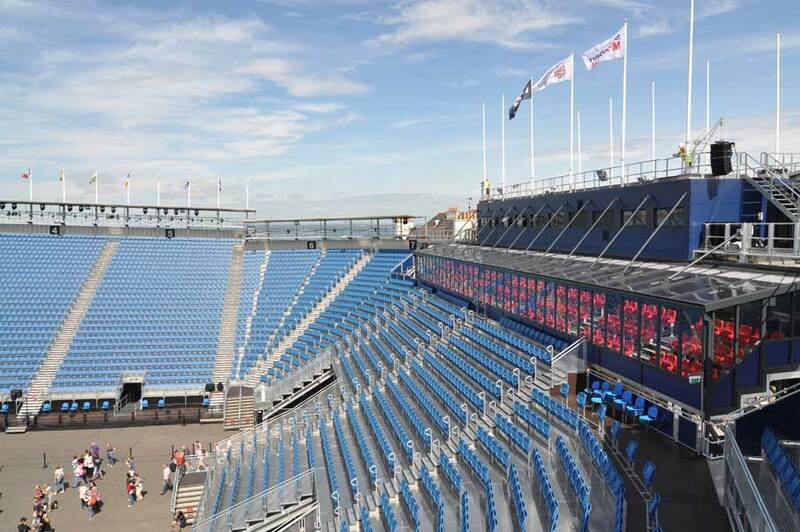 When “Scotland the Brave”, Scotland’s unofficial national anthem, is played at this year’s “Royal Edinburgh Military Tattoo”, the visitors will take their places in a brand-new grandstand engineered by the Radolfzell engineering consultants formTL. Radolfzell / Tübingen, August 2011. 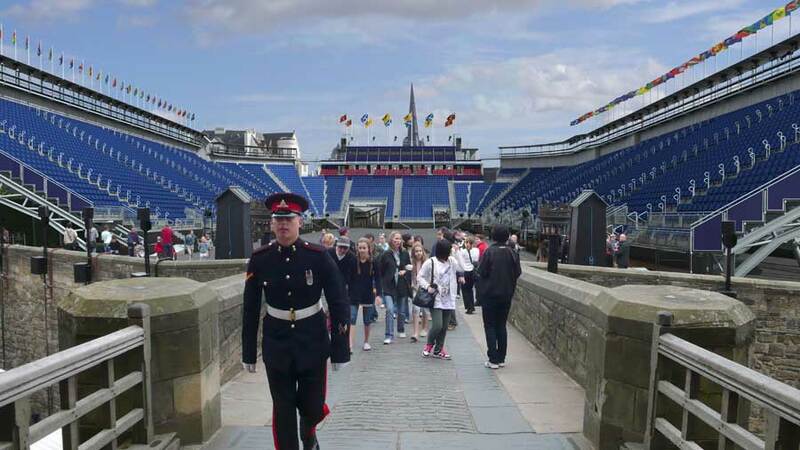 Since 1950, the Edinburgh Military Tattoo has been a well-attended tourist attraction, with a live audience of up to 217,000 people and more than 100 million people watching the event on television. Also the Royal Family visits the festival frequently. Incidentally, Her Majesty, Queen Elizabeth II, demonstrated her affinity with the festival in a very special manner in 2010 by conferring a “Royal” title on the event, which is now entitled to call itself “The Royal Edinburgh Military Tattoo”. 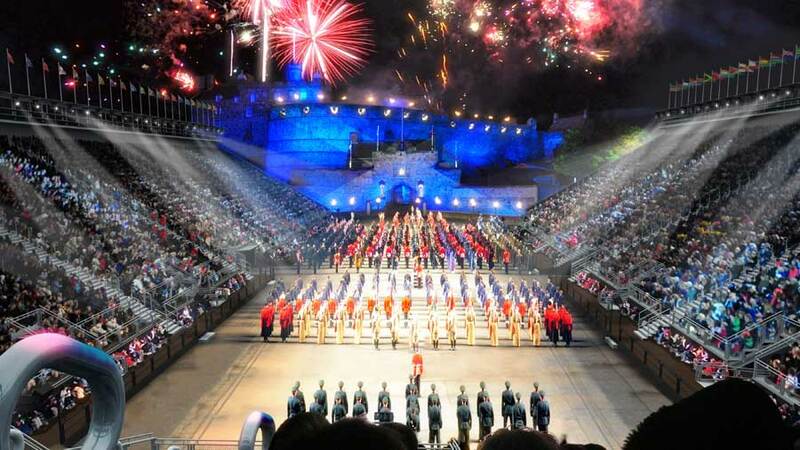 Scotland’s largest festival of military-inspired music is held against the spectacular backdrop of Edinburgh Castle on the Castle Esplanade. Regarded as being one of Scotland’s most important landmarks, Edinburgh Castle is perched on Castle Rock, a basalt crag that falls away steeply on three sides. The spacious music festival grandstand has to be set up every year anew. 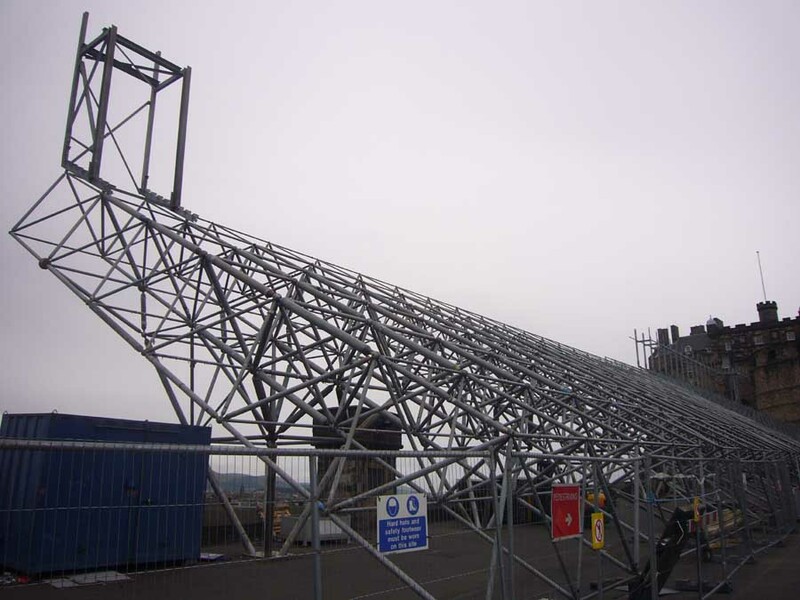 The erection phase for the old MERO spaceframe construction amounted to around 3 months. Visitors to the castle had to put up with restrictions during this period as a result of this work. 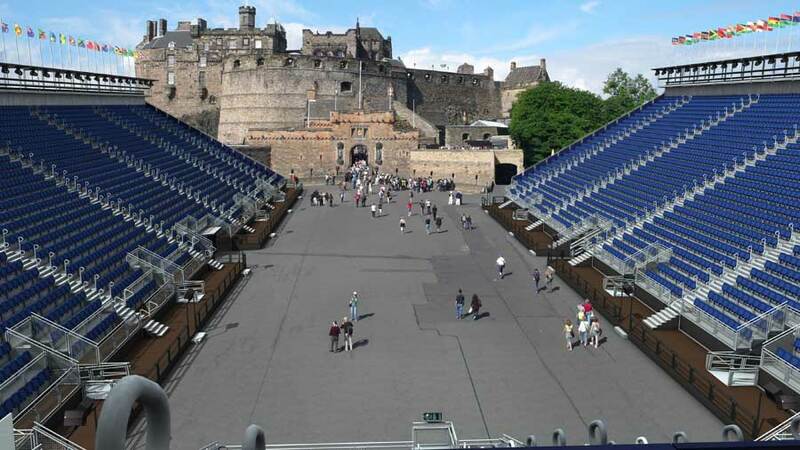 Historic Scotland, ‘landlord’ of Edinburgh Castle, and the host of the music festival, The Royal Edinburgh Military Tattoo Ltd., therefore unanimously agreed to improve the way in which the shared location is organised in the future with a new grandstand construction. 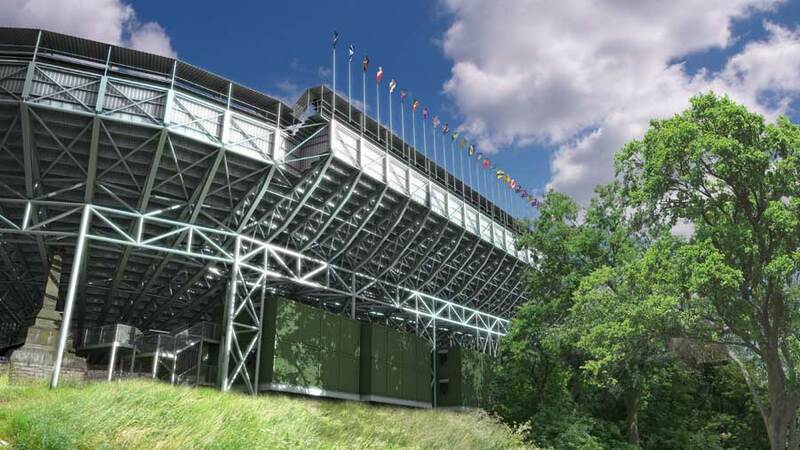 The pivotal criteria for the new grandstand were as follows: the set-up time must be reduced by half and tourists must be able to access the Castle Esplanade during this process. General contractor Sir Robert McAlpine Ltd. entrusted the design of the pile foundation and testing of the new temporary grandstand structure to the engineering firm Arup Scotland, and the design and delivery of the grandstand to Nüssli (Schweiz) AG, a leading supplier of event, trade fair and exhibition constructions. 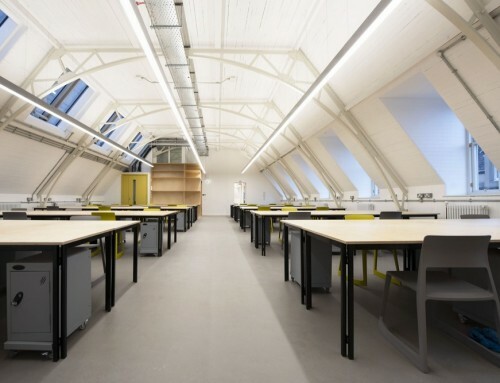 Nüssli then engaged the engineers of formTL/Radolfzell to carry out the associated structural design. formTL was responsible for designing the U-shaped grandstand and the steel substructure for the VIP hospitality suite and the engineering container for the east complex. 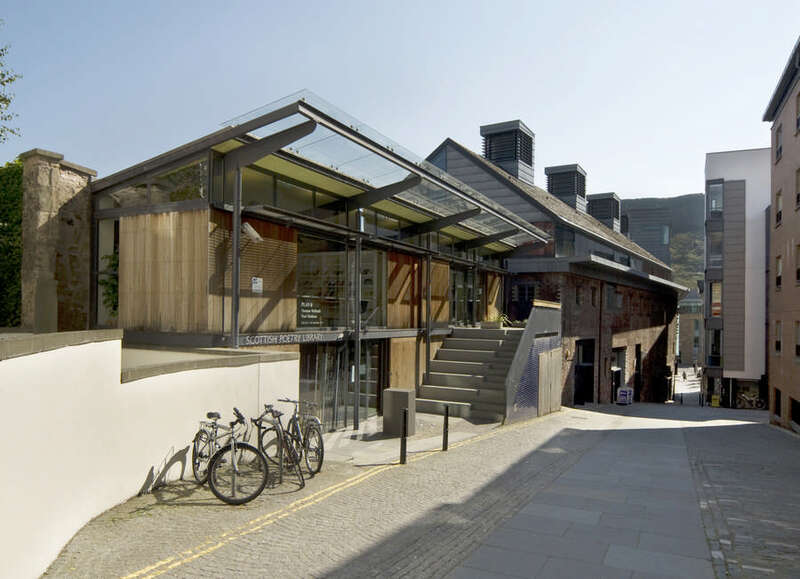 The Radolfzell engineers designed both of the steel structures right through to the approval stage. In addition to this, they also assumed responsibility for the support detail design and the connection to the pile foundation. The steel supporting structure for the north and south sections of the U-shaped grandstand comprises fishbelly girders, spaced 3.5 metres apart, which are mounted on V-shaped supports around the outside of the south grandstand. The enormous lattice girders extend over 28 metres and are divided by just a single end-plate connection in the middle. The south grandstand projects beyond the crag of Castle Rock by up to 9 metres in order to accommodate seating for around 8,800 people and the VIP hospitality suite in the limited space available on the Castle Esplanade. The main girders for the north grandstand are mounted on a horizontal 3-chord truss, which distributes the load over tower supports. The girder grids for containers that will serve to accommodate the musicians are located in the vicinity of the tower supports. 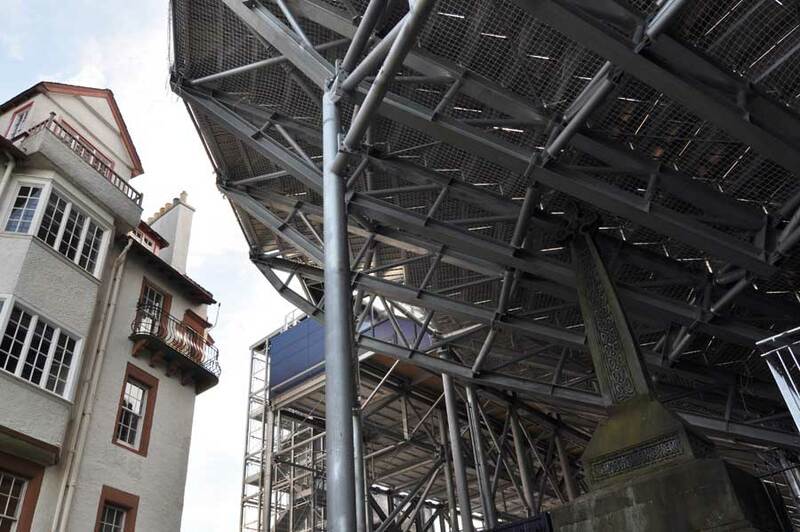 Stairways are integrated into two of the towers, offering the musicians a means of accessing the Esplanade. There are up to 26 rows of seats arranged on the girders for the north and south grandstands, which means that people in the top rows are sitting around 13 metres above the parade ground. The east grandstand is situated in front of the VIP complex, whereby its main girders are borne by numerous supports. A gantry runs above the top rows of seats on the north and south sides, enabling the installation of loudspeakers and lighting. These are linked to the production level in the east complex by gantry bridges in the corners of the grandstand. Another bridge offers wheelchair users a means of accessing a level that has been sunk into the south-east grandstand from the elevator in the east complex. Slipping supports for all three bridges prevent stiff connections forming between the grandstands and the east complex, which could otherwise give rise to constraining forces from different types of strain. The gantry construction that spans the entrance to the Esplanade in the east complex accommodates the VIP and engineering containers. The floor in the VIP area is 12 metres above the parade ground. 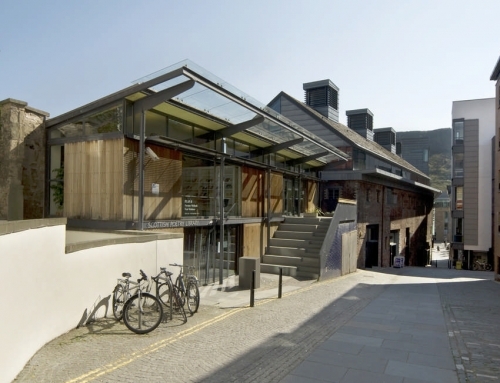 Its central support divides the access road into two passages, each 12.5 metres wide. One of the main tasks assigned to formTL was to investigate the grandstand dynamics. The British inspection engineer demanded compliance with the most stringent of the four local requirements for the dynamic load assumptions. 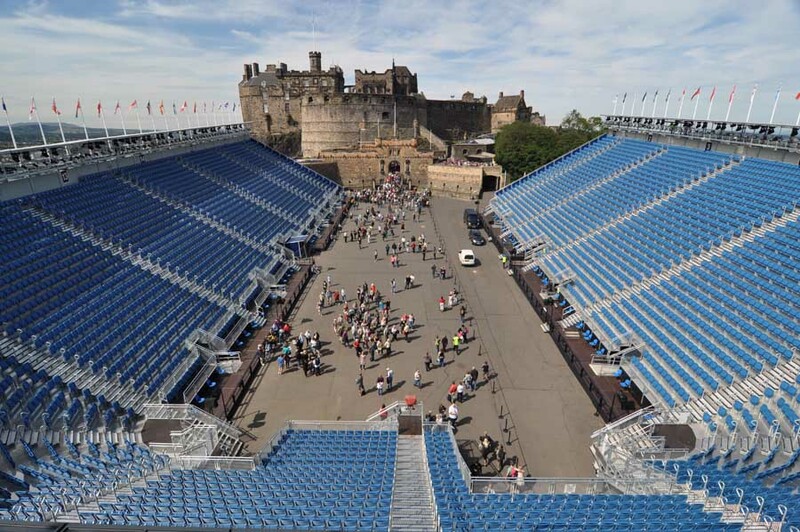 Even if visitors to the “Royal Edinburgh Military Tattoo” are not generally known for their tendency to get carried away and generate extreme dynamic loads, the construction must also be capable of withstanding the rhythmic audience behaviour expected at pop concerts etc. The results of a natural frequency analysis showed that the statics would not be jeopardised by the exciting and resonance frequencies encountered under maximum “pop/rock concert” load conditions. Weighing 850 metric tons in total, the steel construction is erected for the first time in 2011. 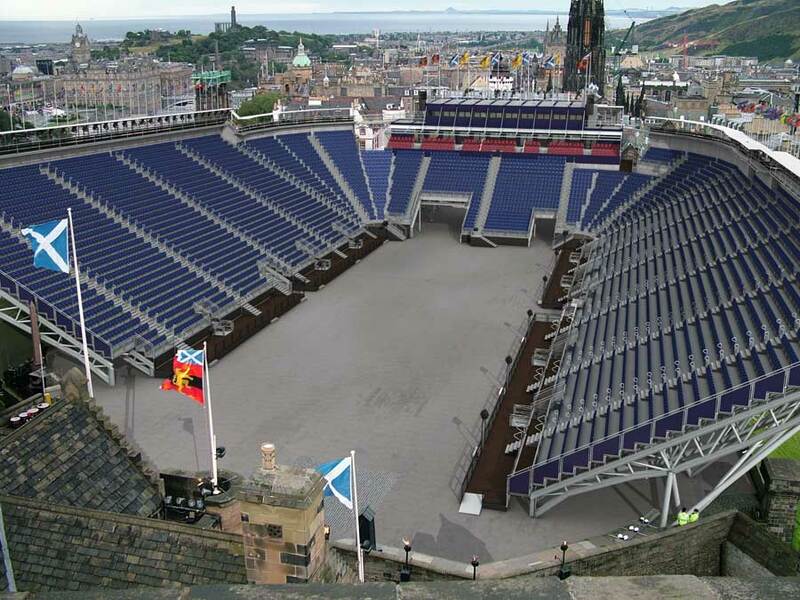 When the festival is over, the individual grandstand elements will be stored in a new storage facility near Edinburgh until the Royal Scots Dragoon Guards prepare their drums and pipes to play “Scotland the Brave” once again in 2012. 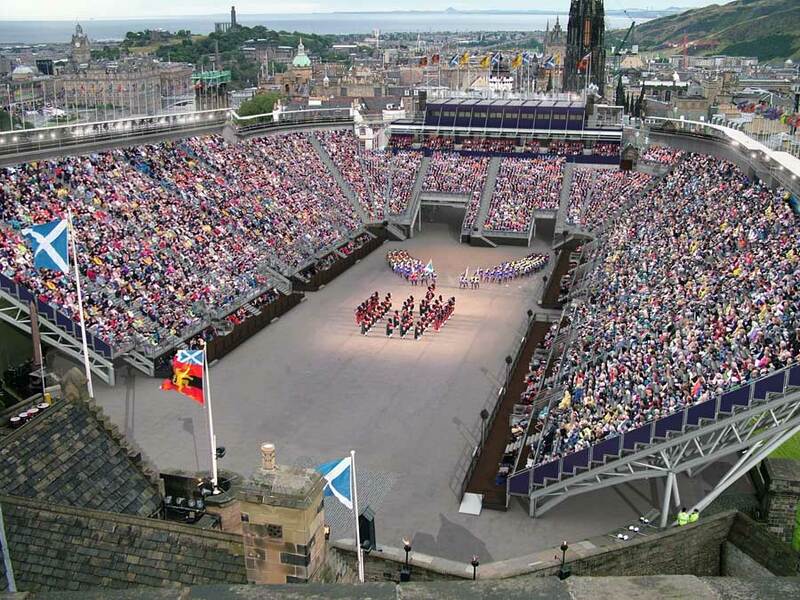 Owner: The Royal Edinburgh Military Tattoo Ltd.
General contractor: Sir Robert McAlpine Ltd.
Container supplier: WACO UK Ltd. 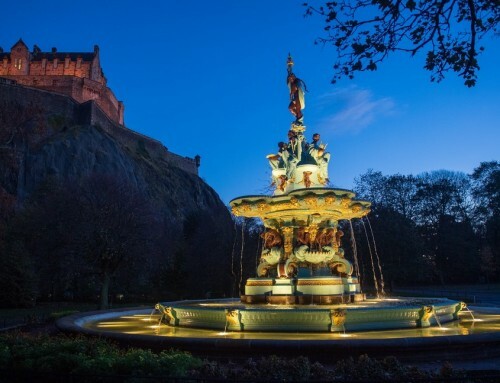 Controversy emerged in Jan 2004 over a former proposal by Morris and Steedman to relocate the Edinburgh Military Tattoo in the west part of Princes Street Gardens, belowEdinburgh Castle. 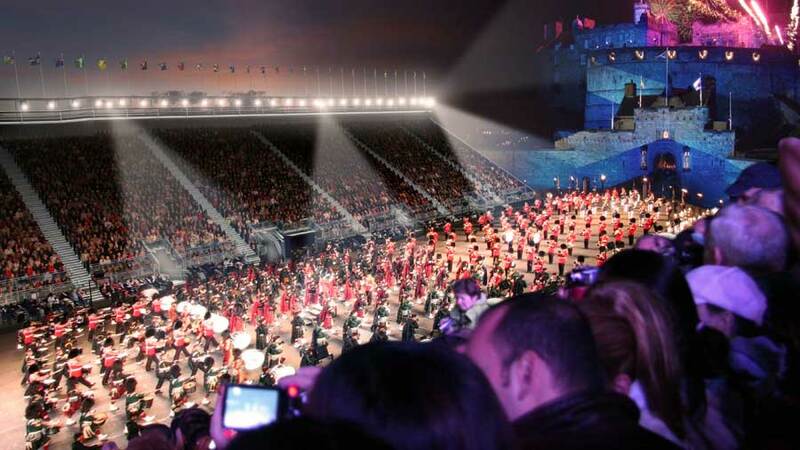 Idea mooted to redesign Edinburgh Tattoo stadium, for intermittent use all year – and therefore fast erection potential – unlike current structure, which many visitors to the city find ugly with its curious blue pods (prominently placed in the middle of the world heritage site it’s hard to comprehend). Surely like the proposed new Forth Road Bridge a suitable candidate to a well-run architecture competition? Make Architects win Ross Bandstand Competition – on a site related to the arena proposal of 1989 explained below. 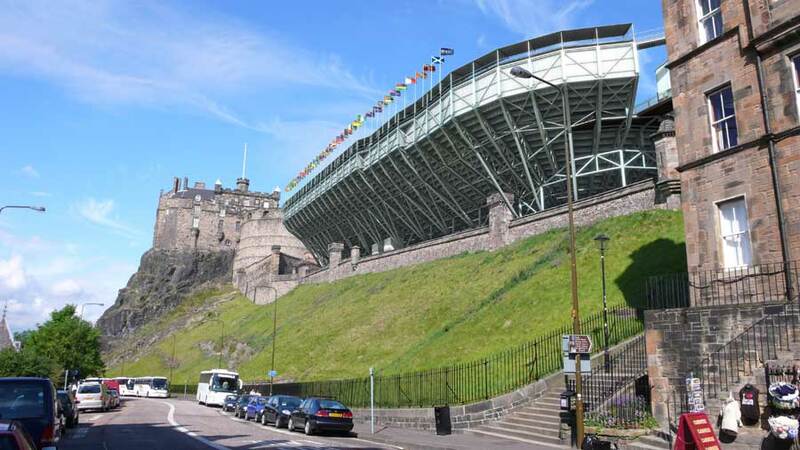 The structurally-expressive temporary stand – erected annually – on the Edinburgh Castle Esplanade is reportedly insufficient for current needs. The Tattoo takes place every Edinburgh Festival for three weeks. In the mid-eighties Morris and Steedman (Architects) were commissioned to produce detailed plans for a 10,000 seat arena, unveiled in 1989 to much controversy. 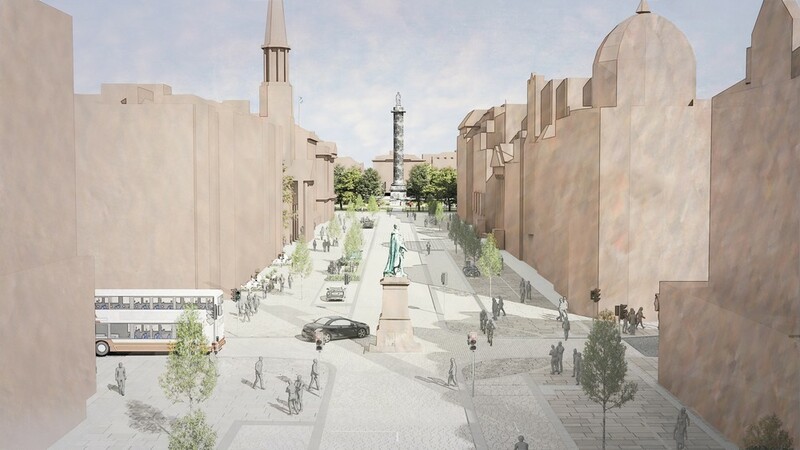 Princes Street Gardens are protected but limited building work has been undertaken latterly as part of the RSA’s Playfair Project (Weston Link). Morris and Steedman’s Arena was apparently influenced by the Acropolis parti in Athens. 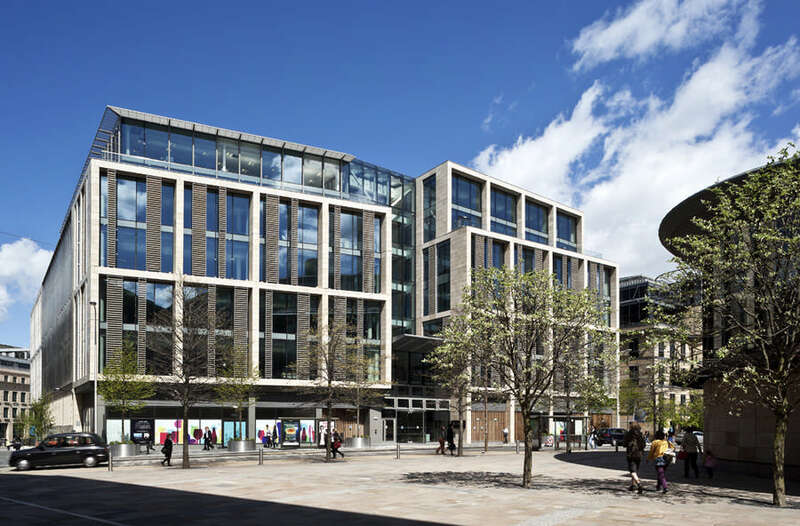 Morris and Steedman amalgamated with né Begg in 2003 to form Morris and Steedman Associates. The practice is known for understated Modern works. The Edinburgh Tattoo is a major Scottish event which is popular all over the world. The Tattoo began in 1950 at Edinburgh Castle is now famous across the globe. 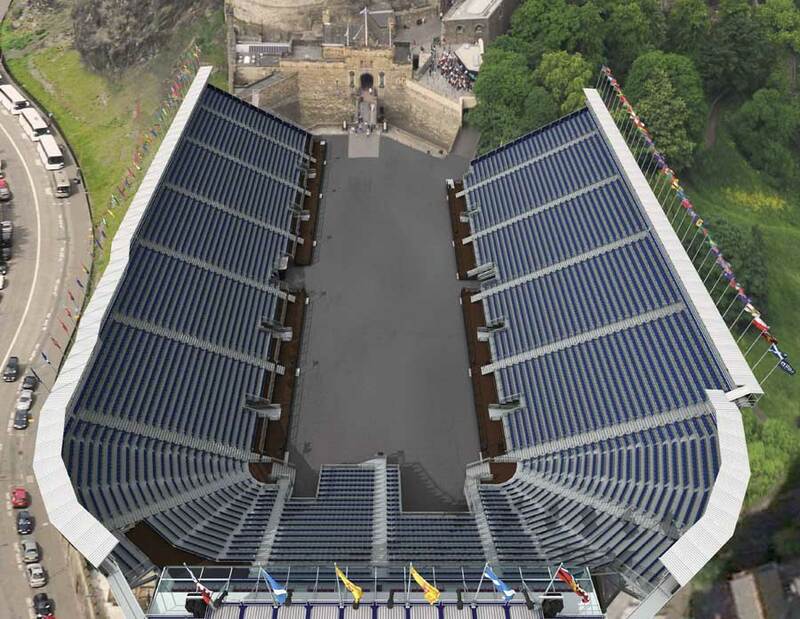 The dramatic ceremony of the Edinburgh Tattoo is highly iconic and rooted in Highland traditions, yet the seating structure is vividly modern, its cantilevered metal spaceframe contrasting with the worn stone context. 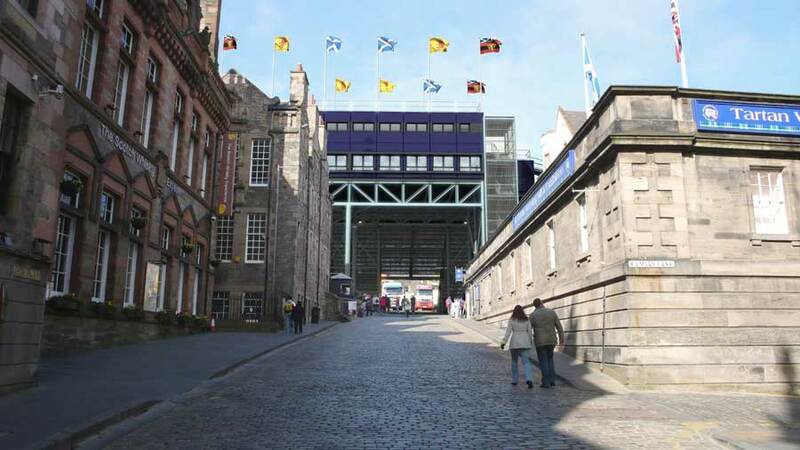 Although it is temporary, for many visitors (ie for the Festival or typically every Summer) the Edinburgh Tattoo is always there and thus a fascinating modern intervention in the absolute heart of the City at the head of the Old Town’s royal axis and high above the city so massively visible: it shouts ‘the Edinburgh Festival has started’. 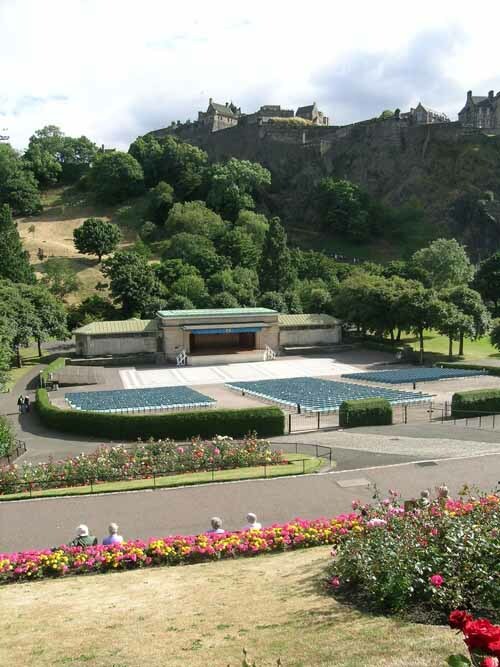 Edinburgh already has an arena in Princes Street Gardens: the Ross Bandstand is mostly used for music concerts. 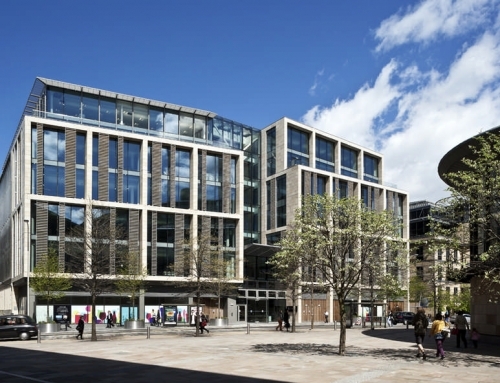 Morris and Steedman Associates directors are Philip Flockhart and Raymond Muszynski but back in the eighties the practice was run by Bob Steedman and Jim Morris. 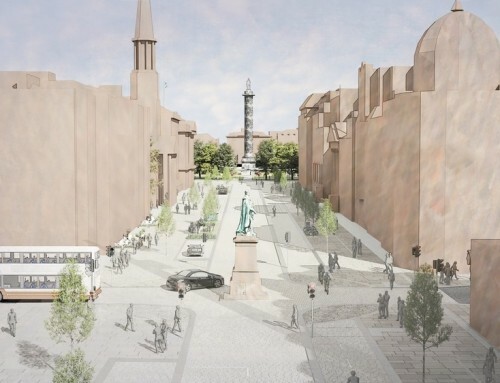 Morris and Steedman have contributed to previous studies on the future of the City of Edinburgh, notably the City Lighting Vision and the Edinburgh Old Town Visitor Strategy. make architects, Arup and Unique Events won an open competition in Aug 2005, organised by the City of Edinburgh Council and Scottish Enterprise Edinburgh and Lothian, to undertake a scoping study to examine a range of options on how the bandstand might be redeveloped.